J. Daniel Bourland, PhD, conducts research in radiation physics and devises irradiation techniques and procedures for animal studies and human clinical trials. He partners with industry and government sources to assess the health effects of radiation exposure in unique animal models and to provide scientific and technical expertise and resources for imaging and irradiation research. J. Daniel Bourland, PhD, earned both his master of science in public health degree and his doctoral degree in health and medical physics from the University of North Carolina. After completing his postdoctoral work, he worked in radiation oncology at the University of North Carolina at Chapel Hill and the Mayo Clinic until he moved to Wake Forest School of Medicine in 1995. His expertise in medical physics includes small field dosimetry and dose calculations, gamma radiosurgery, imaging applications and medical countermeasures for radiological terrorism. He helped found Wake Forest Baptist’s department of radiation oncology in 1995 and advanced radiation treatment technologies, such as the Gamma Knife program and radiation oncology simulation. Bourland’s work includes writing research protocols and devising irradiation techniques and procedures for animal studies and human clinical trials. He develops novel beta radiation sources to study radiation skin injuries and treatments for those injuries. He also studies the effects of whole-body radiation, including the effectiveness of radiation on cognitive function and its implications for long-term space travel. 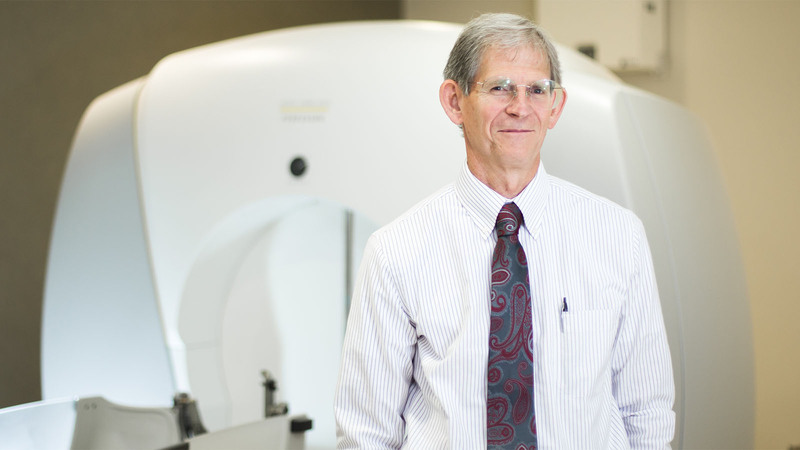 As head of the Radiation Physics and Dosimetry Core at Wake Forest Baptist, Bourland offers scientific and technical expertise and resources for imaging and irradiation research. The core supports physics and biological research through consulting on the use of imaging and irradiation modalities, electron and photon irradiations, as well as radiation dose computation, measurement and assessment. He also directs Wake Forest School of Medicine’s graduate program in medical physics. Bourland participates in Biomedical Advanced Research and Development Authority (BARDA) studies that prepare for large-scale response to radiological events. He works with industry partners to determine if existing products can be re-tasked for use during radiological events. These projects include assessing therapeutic and medical device products for their ability to treat radiation skin injuries from beta particles, gamma rays, X-rays and whole body radiation and to detect biological changes in blood due to radiation in order to develop methods to assess radiation doses. Bourland frequently partners with companies on BARDA studies and other research projects. He collaborates with a variety of multidisciplinary investigators, including biologists, neuroscientists, radiation oncologists, veterinarians and biomedical engineers. He collaborates with industry in areas such as research and clinical consulting, dose assessment, model development, radiation protocols and imaging and radiation devices.